This artist series is special. It comes to us from the land known as Ghana which is a country located in west africa bordered by Ivory Coast to the west and the Gulf of Guinea to the south. The word Ghana means "Warrior King" and derives from the Ghana Empire. A friend of ours did some A.P. work there and met the Artist. He produced two tapestrys which were organic in dye and use of textiles. Upon arriving here in the U.S. the two items were scanned color corrected and treated with reverence. 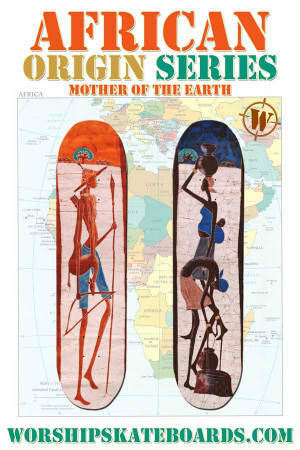 The basis for this series is the origin of man and the mother earth. These are from a 50 board run of each graphic and are for sale as art as opposed to a simple skateboard and so the price reflects the handful of these that are remaining. We hope they hang proudly where ever it is you decide they belong.